Published Feb. 11, 2019 at 1:56 p.m.
A home is going up for sale in Cudahy and the listing doesn't suggest anything terribly out of the ordinary: four bedrooms, single-family, a bath and a half, two-and-a-half-car garage, Victorian, $268,800. But the 2,400-square-foot Queen Anne home at 3806 E. Van Norman Ave., is anything but typical. The house, with its pair of distinctively curvaceous barrel-vault dormers – that appear to be eyeing the neighbors with suspicion – and rounded porch, was built in 1892 (some say 1890), and was declared a Milwaukee County Landmark in 1989. 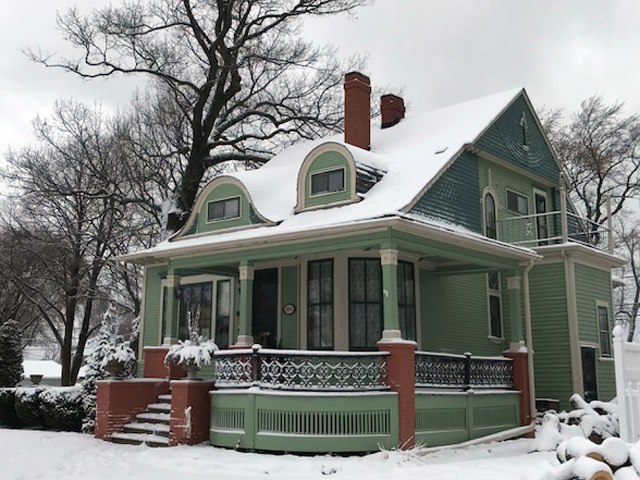 The home was built in 1892 by the by Cudahy Bros. Land Investment Co. and sold two years later to Henry C. Schade, a well-known land agent and developer for the company, for $1,950. 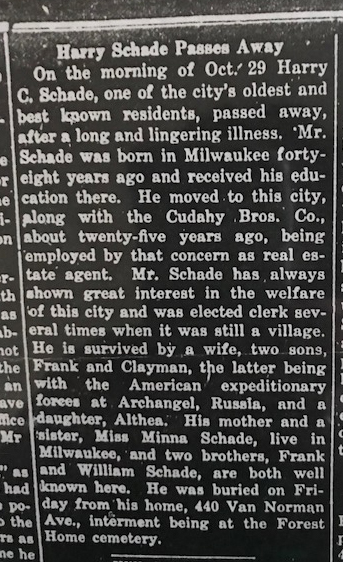 Born in Milwaukee in 1869 of German parents, Schade arrived in Cudahy in the early 1890s to work for the company and soon distinguished himself in town. 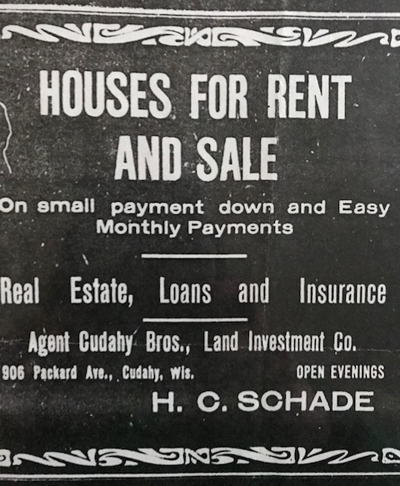 As part of his work for Cudahy Bros., Schade was instrumental in developing 700 acres of the old rural town of Buckhorn into the company town of Cudahy, by purchasing and subdividing farms and selling the plots for development. It is said that many of the deals were transacted on the porch of the Schade home. According to an obituary that appeared in newspapers upon his death in October 1918, Schwade was, "employed by that concern as (a) real estate agent. Mr. Schade has always shown great interest in the welfare of this city and was elected clerk several times when it was still a village." Having arrived at his lovely house at what was then 440 Van Norman Ave., Schade and his wife Maud, raised a family there, adding modern amenities like indoor plumbing and central heat around 1903. After Schade's death during World War I, his wife Maud stayed on another five years, often taking as boarders single women who arrived in town to work as teachers at nearby Lincoln School. In 1923, the house changed hands numerous times, being sold first to the Kaplanek family and in again in 1924 to Albert and Alma Stresing. 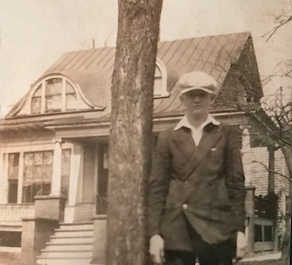 Among the interesting objects related to the home that current owners Kathy and Steve Liszewski have collected include a photo of young Ervin Greinke outside his aunt and uncle Stresing's home in 1925. Another such object is an invitation to a nearby party dated 1899 that the Liszewskis found inside the kitchen wall. For about a year in 1928, St. Mark's Evangelical Lutheran Church accepted an offer from the Stresings and held services in the dining room and Sunday school classes on the steps leading upstairs, until its building was completed at 3515 E. Van Norman Ave. Afterward, it sat vacant until the Andrew Tomaro family purchased it in the mid-1930s, remaining for more than two decades. In 1959, John and Veleta Delaney bought the house and raised eight children there, before selling to the current owners in 1987. In well over a century, there have been but five owners of this unique home, which sits atop a foundation of cream city brick that was glazed orange. And, fortunately, much of its original beauty remains intact, including stained glass windows in the living room, original wood trim and detail in the entry and open staircase, pocket doors separating the living and dining rooms, decorative plaster ceilings on the first floor, the original iron porch rail and multiple fireplaces. In 2004, the home – one of just a few surviving 19th century homes in the city – earned a Cudahy Vitality Award, and you could argue that the Schade House is really the heart of historic Cudahy: surviving in the southwest corner of its yard is the embedded surveyor's benchmark used to plat the neighborhood. A house in a nice neighborhood near the lake and Sheridan Park, with that kind of history and so stunningly beautiful seems like anything but an, ahem, Schade deal.